It's once again All-State and Honor Band season across the country, and I am always eager to try to create something of value for our auditioning Wyoming students. (If you're also trying for All-Northwest Wind Symphony, check out my post with videos here.) I have recorded myself performing this year's etudes, which you can find on my You Tube channel and in this post. A few thoughts about the value of taking these auditions: Every time you challenge yourself to learn a new, difficult piece of music to the best of your ability, you get better as a musician! You also get a chance to practice getting nervous--and getting past those nerves-- in performance, which makes the next performance less terrifying. And whether or not you get the chair you want this year, you can be happy in knowing that you stretched yourself and grew both as a flutist and as a musician from the experience. There's no punishment for not getting in, and potentially great reward if you do make it, so it's the easiest gamble you'll ever make. Given all you'll learn about yourself and how to learn music, you'll win no matter what. You can download all three excerpts (two for flute, one for piccolo) and scales here. Scroll to the end of the download for the optional piccolo excerpt (it's after the scales). Although there is no indication of articulation length, you'll notice I make mine a little on the short side in the video. I think it fits the march-like character better than legato would (and displays more variety in your abilities, since you'll be playing legato in #2). Keep it light--we often have a tendency to pound the high notes with heavier tongue, but that will produce a very harsh, unpleasant sound. Each phrase has a clearly marked dynamic, and they must all sound different. Map out your dynamic range on a single stable pitch: piano is the quietest sound you can make with a focused sound and excellent pitch, mezzo piano is one obvious notch louder, mezzo forte another step louder, etc. Fortissimo should still be in tune. To get louder, you drop your jaw (it should naturally go down and back at the same time) in increments for each louder dynamic. Conversely, to get quieter, your jaw will come up and forward slightly, like saying "oooo". Remember you'll have to do some shifting within each dynamic to ensure that every note is your chosen volume (in the first measure, shifting down for the second, third, and fourth notes and then shifting back up to the high F so you don't sound like you're screaming, mumbling, then screaming again, respectively). Make sure your fingers are all working as a team on each note! Always practice with a metronome, and alternate very slow practice with woodshedding/looping techniques (minimum 10 perfect repetitions or 1 minute per day on each short difficult passage) daily. You'll see a link to my post describing these practice techniques in "scales", below. It is highly unlikely that you will be able to do the phrase from mm. 8-downbeat of 12 in one breath while performing a convincing crescendo to fortissimo. Prioritize the crescendo. In the video, you'll notice I breathe between measures 10 and 11--see if you can make this work for you. Just maintain a resonant ff on either side of the breath and it will still sound good. Choose one goal note per phrase to help you keep a sense of forward motion; every note leading up to that goal note should have a slight sense of growth, and any notes after your goal will recede slightly. Your goal note should happen pretty late in each phrase--see if you can hear mine in the video! If q=72 is too slow for you to play beautifully, start by practicing at the slowest comfortable tempo you can do, then gradually slow it down in increments. You haven't perfected a tempo until you can play in tune, with clear tone and correct dynamics ten times in a row. Your default articulation here is the slur, but be sure to clearly articulate repeated notes, legato style. Be sure your vibrato depth/speed matches your volume--shallow and slow for piano, deep and fast for forte. Practice whole notes crescendo from piano to forte, then decrescendo back to piano ("diamonds") and experiment with your vibrato to fill up, but not go beyond the borders of, your sound at every volume. Be sure your E to F# slur sounds clean every time--no accidental grace notes! 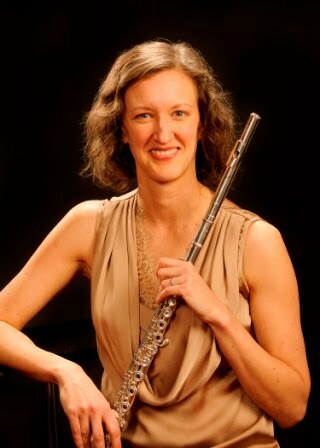 I encourage all flutists to practice piccolo enough that they feel confident on it. It's part of our instrument family, after all, and affords another opportunity to get into any ensemble, whether it's an honor band or a professional orchestra! Here are some tips to get started. Dynamics work the same way on piccolo as they do on flute (briefly described under "Etude #1"), but the range is more limited. Figure out how quietly you can play on the second line and don't try to go below that threshold. If the notes don't speak, your audition won't sound very inspiring. As you are finding your forte, be sure you've shifted down enough to keep from going sharp; check everything with a tuner. Variety in articulation is important here, and the piccolo is very sensitive in this regard. It takes very little work to articulate, so be sure you're keeping the staccato light enough to avoid sounding violent. Legato is accomplished mainly by threading steady, generous air through the line and lightly interrupting with a "du" tongue. Deadlines: check in with your band director early and often about getting everything recorded and turned in on time!